Is morning or afternoon cutting best? One of the long-standing topics of debate in the forage world is whether it is advantageous to cut in the morning or during late afternoon. People still hang their hat on one side of this argument or the other. The preference for late afternoon cutting is compelling and originated from a number of studies that were done in the western United States. Not only was the PM-cut forage (both alfalfa and grasses) of higher quality, but the researchers also had convincing evidence that animals preferred it to AM-cut hay. The result was improved animal production. Some basic plant physiology concepts drive the preference for PM-cut hay. Plants accumulate carbohydrates in the form of sugars and starches through photosynthesis during the daylight hours. These carbohydrates are produced faster than the plant can get them translocated to the root and crown or be used for growth and maintenance. Concentrations of these nonstructural carbohydrates, which are nearly 100 percent digestible, reach a peak toward late afternoon. In alfalfa, leaf-to-stem ratio also peaks at this time. The Western states’ research showed that they were able to hold the advantage of PM-cut hay through feeding. Why cut in the morning? During hours of darkness, photosynthesis shuts down and respiration becomes the dominant plant process. The nonstructural carbohydrates are used during respiration for normal plant maintenance and growth. This leads to a declining concentration in plant tissues until the sun rises from the East once again and the cycle repeats itself. Given the diurnal or daily variation in nonstructural carbohydrates, it makes good sense to cut legumes and grasses in the late afternoon . . . except for one important factor: Plant physiological processes don’t stop after cutting. Plants are like people — they fight to stay alive even after a traumatic experience like cutting. Respiration continues until plant moisture reaches about 50 percent. In fact, photosynthesis continues for those cut plants that have a direct line to sunshine. This is one of the compelling reasons for cutting hay into a wide swath, along with shortened dry down times. Given the importance of moisture in preserving forage quality, dry down rate becomes an essential factor in preserving cut-forage quality. Long drying times translate to extended plant respiration following cutting, negating any effect of sugar content at the time of cutting. In the West, low humidity, cool nights, and plenty of sunshine make for fast dry down rates, especially for the initial dry down phase to 60 percent moisture. Hence, cut forage quality is preserved more easily than in the humid East. 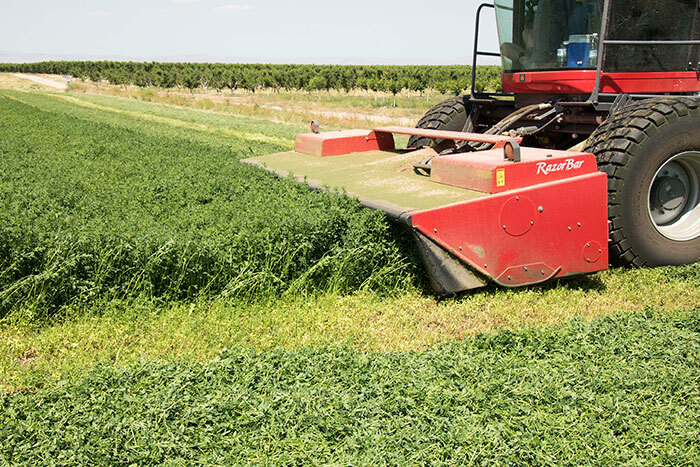 In the latter case, cutting in the morning is needed to ensure forage moisture reaches 50 percent before the overnight hours, or at least without going more than one overnight. In regions where rainfall is frequent, beating the weather trumps any strategy for time-of-day cutting. Morning cutting usually is going to offer a wider window of confirmed favorable weather, if there is such a thing. As hay growers know, having dried hay rained on can be devastating to forage quality. There are two ways to preserve cut forage quality. One is to mow when it’s at its highest quality and the other is with rapid dry down. The latter factor is the more important of the two. Though late afternoon cutting may be advantageous in arid Western regions, growers in humid areas will benefit from a morning cutting that is followed by several dry, sunny days. The advantages of late afternoon cutting may sometimes be put into play for humid regions where rapid drying rates are ensured. This might be the case for some late summer, lower-yielding cuttings. It also may apply when the forage is harvested as greenchop. Finally, let’s not forget that plant maturity is still king when it comes to forage quality. Overly mature plants, cut at noon or midnight, still make for low-quality forage.